Let’s play truth or dare. You chose truth. Would you believe Robert Redford as 60 Minutes reporter Dan Rather? No? You would be right. Ok, next up, truth or dare? Dare? I dare you to watch “Truth”. Truthfully, “Truth” is not a bad little flick. Let’s get reel and break this down. Writer/Director James Vanderbuilt brings a tense thrill ride of dialogue fueled scenes with great character moments from Cate Blanchett. I think political/reporting movies are going to be either entertaining or downright boring; and I can tell you that this is entertaining. While it may not have the most fleshed out characters for the story presented, it was still intriguing and showed the dirty side of politics through the media. The writing is particularly good as it is what drives this movie. It’s sharp, on-point, and makes news more suspenseful than it actually is. Some of the characters are a bit underdeveloped and, this might be greedy, but I wanted to see more of Dan Rather’s point of view and what he was going through during this whole investigation. We see a bit, but I wish it balanced Mary (Cate Blanchett) and Dan out with equal screen time since they both went through it together. Cate Blanchett is always incredible and she delivers a solid performance and has the most character development, and towards the end you were rooting for her or against her depending on what you believe. I will say that this was my favorite Topher Grace role after his run on “That 70’s Show”, sorry, not sorry, “Spider-Man 3”. 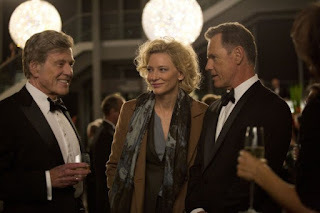 I love Robert Redford to death, and I think he is a film icon, but the man didn’t embody Dan Rather. I felt like Robert stumbled onto set in a suit and the director said, “Mr. Redford will do.” All I saw was the Redford. A typical newsroom setting with each frame filled with long walks through offices of many people and a lot of computers. It’s kinetic and it flows with pace of the film. At least it isn’t shot horribly and when you can do that you will be fine. If you are interested in this story then it will fly by, but if you don’t care for newsroom type movies with a lot of dialogue or this particular story, you might find it slow. I kind of ruined my thoughts on that in the pro section, which was dumb on my part. This is a typical, kinetic, dialogue filled newsroom movie focusing on this particular scandal and I found it quite entertaining. Cate Blanchett was fantastic, however, surround by people who felt like they were there just delivering dialogue. I still recommend it.